After you have added a repair bid, you can add more vendors to the bid at any time. You can also add a Vendor Contact link for quick and easy access to the main contact's information or for the purpose of adding additional vendor contacts. 3. Click the drop-down arrow in the Vendor box. 4. Select the desired vendor, then click the Add button. 5. Click the Bids sub tab again to refresh the screen. Your new vendor will appear at the bottom of the dialog box. 2. The screen below will appear. Any contacts that have been previously added will display. 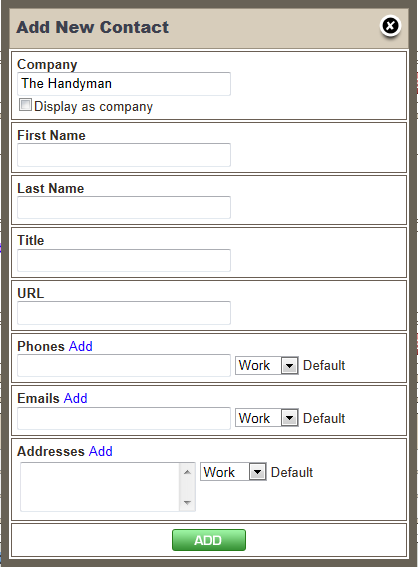 To select an existing contact, click Use, located adjacent to the contact's name. 3. If you wish to create a new contact, click Add New Contact to reveal the screen below. Add contact information and click the green Add button. 4. Contacts you add will be displayed in the Vendor Contacts section, as shown below. The first contact you add will display in a green box, noting it as the primary contact. Additional contacts will display in yellow boxes. If you wish to change a secondary contact to the primary contact, click the button from that contact's box. For more information on working with vendors, see Vendors. 1. Locate the vendor on the Bids tab. 2. Click the red Delete button and confirm the deletion in the confirmation dialog box. The vendor will be removed from this bid only.